(Pacific Disaster Center: Natural Hazards and Vunerabilities Atlas (September 2, 2009) Click MAP for situation of TODAY. Pacific Disaster Center's Natural Hazards and Vulnerabilities Atlases are powerful decision support toolsets for disaster management and humanitarian assistance organizations around the world. Next to the Global Edition (displayed) there is an Asian and a Hawaii edition. The Atlases contain information on major hazards, both "active" and "historical," including tropical cyclones, earthquakes, tsunamis, volcanoes, floods, and wildfires. They provide decision makers with the needed geospatial context for assessing risks and communicating about natural hazards and the exposure that people and infrastructure have to these hazards. They support the entire range of the disaster management "life cycle" from hazard assessment, to early warning, to response and recovery operations. Not selected at the map above is the H1N1 Swineflu. If activated it should colour the picture red with the dozens of symbols displayed. Fires in the World at the Web Fire Mapper (September 2, 2009). Click MAP for situation of TODAY. At the Web Fire Mapper it seems September 2, 2009, the whole southern part of Africa is in fire. The only inferno in World News, however, was the fire around the Hollywood sign near Los Angeles. That fire can be found enlarging the world map < < around Los Angeles. The same situation at African Mocambique > makes clear isolated wildfires are raging there. It's possible agricultural burning, for pasture renewal and land clearing. The Web Fire Mapper is build by The Fire Information for Resource Management System (FIRMS), funded by NASA. It is a web mapping interface that displays hotspots/fires detected by the MODIS Rapid Response System and delivers near real-time hotspot/fire information to international users and support fire managers around the World. The Web Fire Mapper is an internet based mapping tool that delivers locations of active fires in near real time. For selected regions and countries you can view an interactive map showing active fires for a specified time period, combined with your choice of GIS layers and satellite imagery. Each fire detection represents the center of a 1 km pixel flagged ... as containing one or more actively burning fires within that pixel. The active fires are detected using data from the MODIS (or Moderate Resolution Imaging Spectroradiometer) instrument, on board NASA's Aqua and Terra satellites. The open source map has lots of attributes to select the information you want about any place of your choise within one week ago. You can subscribe for Fire email alerts. World Fire Map (ISDR) International Strategy for Disaster Reduction. Current & archived significant global fire events and fire season summaries. Near-real time spaceborne observations to visualize active vegetation fires and fire effects utilizing two satellite systems/sensors, the NOAA AVHRR (Advanced Very High Resolution Radiometer) and, to a limited extent, the NOAA GOES (Geostationary Operational Environmental Satellite). With Global Fire |Map and daily/weekly updates for the different countries/continents. Earth Observatory is only one of the 'cool' NASA websites. Earth Observatory Natural Hazards gives a selection of different topical hazards. The goal is to visualize where and when natural hazards occur, and to help mitigate their effects. Every day there is a new Image of the Day. The choises are filed in a voluminous archive. The purpose is to provide a freely-accessible publication on the Internet where the public can obtain new satellite imagery and features about about our home planet. if you want to know more, ask a scientist. You can subscribe for a weekly short notice from the Earth Observatory, telling you about the latest stories, data, and other points of interest that have been added to the site. - The Newsroom, where NASA news announcements, summaries of headline news, listings of new published research, media alerts and more are updated each week. - Data & Images lists all the global-scale measurements displayed by the Earth Observatory, and the months for which they are available. - Features like tracking the Water Quality, the Hantavirus Risk, the Reunion Island Volcano and Ozone in the lower atmosphere (troposphere). - A Glossary explains terminology and concepts. - The Mission Control presents detailed information on current and planned Earth observing missions. J-Track provides live the positions of an number of satellites, the Sun and and day/night over the Earth. - The Experiments focus on how NASA uses Remote Sensing to study how and why Earth changes and can be used to teach all ages about the art and science of space-based Remote Sensing. ANOTHER HAZARDS AP: Natural Hazards Map NATural Hazards Assessment Network (Runs only correctly with Microsoft Explorer 6.x or higher). Lightpollution.it is the English name for the Italian website Inquinamentoluminoso.it of the Light Pollution Science and Technology Institute. The item The night sky in the World demonstrates the world wide light pollution and shows what we miss. 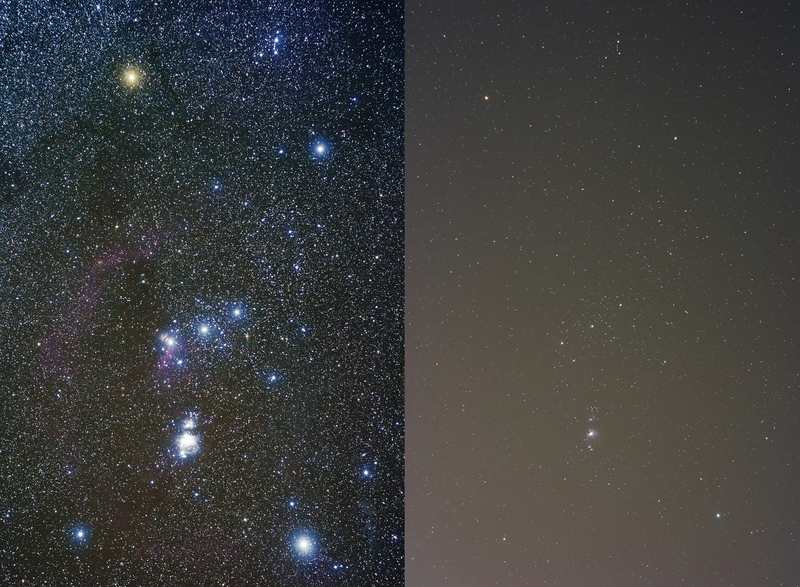 At the picture you see left many stars at a bright sky; right only a few because of light pollution. How is the sky outside your home? No light pollution in North Korea, according to this item in 2002 of Global Security. US Defense Secretary Rumsfeld stated: "If you look at a picture from the sky of the Korean Peninsula at night, South Korea is filled with lights and energy and vitality and a booming economy; North Korea is dark." Strange Maps concluded: "There is only one bright side to this darkness that I can think of: North Korea must be a fantastic place for stargazing." There is a chanche to see the Northern Lights at your monitor from the village of Porjus in Swedish Lapland. This is the place where Northern Lights are most frequently seen and are at their best. Alternative is The Sky of Jokkmokk, with travelogues in Japanese language. 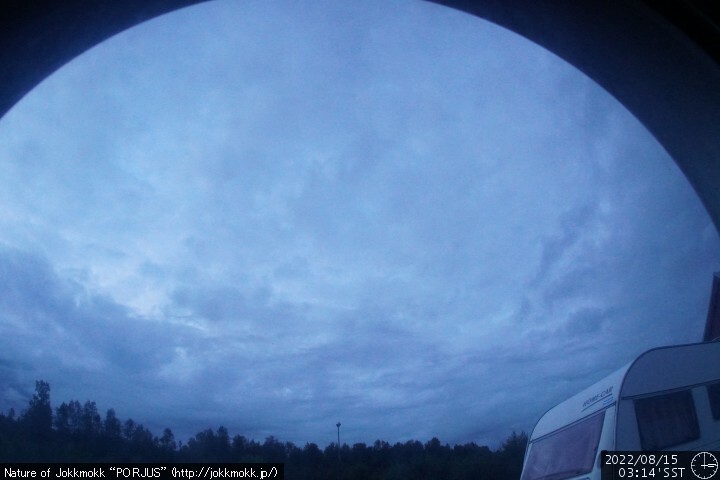 Furthermore Jokkmokk offers three webcams to see the Lapland sky from several directions.